I am often asked where I get inspiration for my stories. I’m also often given story concepts and told to write a book about that. Some even go on to describe the story in detail. My response: they should write the book themselves. After all, ‘everyone has a book in them’. So, where do I get my ideas for stories? It can be absolutely anything. It might be whilst watching a TV programme: I get quite a few animal stories from watching nature programmes. It might be something I overhear or something mis-pronounced. Occasionally, it is something I see. For instance, on my desk for quite a few years now has sat Penny Pig (a ceramic pig which we use to save pennies in). On top of Penny sits a Panda, a screen cleaner (she doesn’t have a name, but maybe I’ll have to give her one). On top of the Panda sits a crotched hedgehog. 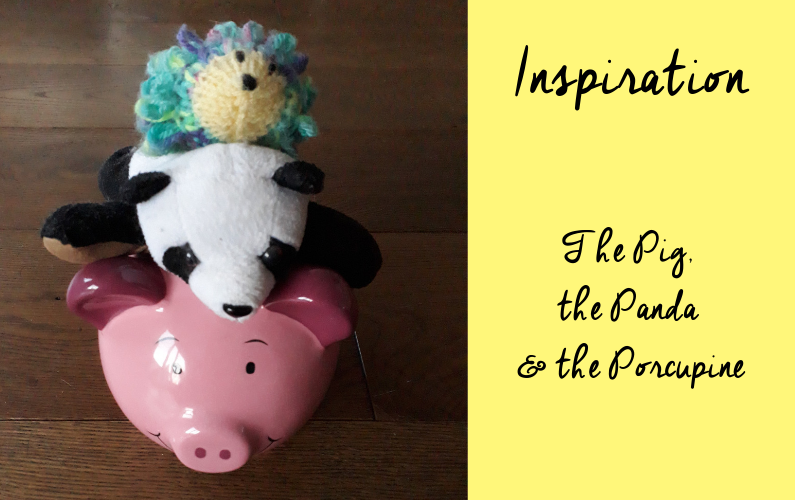 One day, I looked at them, and thought “The Pig, The Panda and The Porcupine”. Well I had to have another P-word; Hedgehog really did not fit in there! This story is still being developed, so I won’t say any more for now. What would you do with this title? I don’t normally start with a title though. That comes last. In any case, wherever the idea comes from, I often don’t know where it is going until I start writing. I sometimes write in rhyme, and then change it to prose, or vice-versa. As I finish a story and review it, I often find that it has a friendship theme. Which appeals to me and helps children whilst they’re still young and exploring how to be a good friend.